The Hugh Mungus saga continues (previously). Hugh Mungus nemesis Zarna Joshi posted a series of videos outlining her views and asking viewers to support her financially via funding platform YouCaring. Ethan Klein at H3H3 gave Zarna $100, then created a companion fundraiser for Hugh Mungus (aka Rudy Pantoja), who recently revealed he has costs related to health treatment. On Monday night, YouCaring abruptly shut down both fundraisers. Anyone who asked YouCaring about killing Hugh Mungus' health fundraiser on Twitter got a canned response that said: "We've removed the Zarna Joshi & Rudy Pantoja fundraisers due to the controversies and bullying they have incited on YouCaring." Rudy Pantoja Jr. aka Hugh Mungus is a wonderful man who has selflessly fought against being harassed and defamed. When presented with the opportunity to self-promote to 4 million people, he only asked that we donate to a woman's charity that helped get his daughter off the street. Now Rudy needs our help. He is having a lot of health problems, he may have cancer, he had a hip replacement, his truck broke down, and he has been served an eviction notice. As it's available, I'll add links to Zarna's new campaign for her safety and well-being. In the meantime, Hugh's new campaign for his expenses is up at GoFundMe. 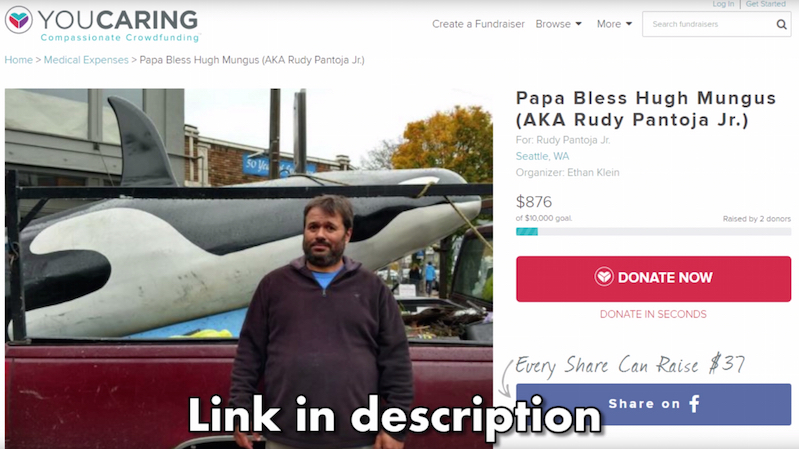 Also, Hugh Mungus is selling a lot of his stuff, like the fiberglass orca he has been hauling around in his work truck, looking for a buyer. Contact Ethan if you'd like to buy a Hugh Mungus fake killer whale.